You arrive in Kathmandu today where we meet you at the airport and transfer you to your hotel. The rest of the day is free (depending on your arrival time, we may arrange a short introductory tour today). This morning your rep will collect your passport and organise your Tibet visa with the Chinese Embassy. After this we will arrange for you to be taken on a guided tour of the unique, sprawling city of Kathmandu. First we take you to visit Durbar Square with its many splendid Hindu temples and the old Royal Palace. Next, we climb the many steps leading to the huge Swayambhunath Stupa which sits upon a hill overlooking Kathmandu. From here you are rewarded with a spectacular view over the city. You will also have plenty of time to visit the numerous little gift shops that line the maze-like streets. In the evening you have an opportunity to check out the numerous bars and restaurants, and soak up the unique nightlife that makes Kathmandu a magnet for travellers from all over the world. We start our exciting journey into Tibet by departing Kathmandu at approximately 5:30am, stopping in Dhulikhel (90 minutes drive) for breakfast. The road we take, follows the valleys of the Sun Kosi and Bhote Kosi rivers, passing through lush green countryside and dramatic cliffs. We should reach the Tibetan border in the afternoon and after completing immigration formalities, we continue along a deep gorge of forests, waterfalls and raging rivers until we reach the town of Nyalam (3600m). After breakfast in Nyalam, we continue to follow the Bhote Kosi valley and after a two hour drive, we arrive at the Nyalam pass (3,800m) from where there are excellent mountain views of the Jugal Himal region including Mt. Dorje Lakpa (6,966m), Mt.Madiya (6,257m) and Mt. Phurbi Chhyachu (6,637m). After taking in the amazing views, we continue our journey via the Lalung La Pass (5,050m) with superb views of Mt.Xishapangma (8,012m), Mt. Cho Oyu (8,201m), and Mt Everest (8,848m) before reaching Lhatse. Today's journey will take us to Shigatse, stopping en route to experience the holy atmosphere inside the ancient Sakya Monastery. Sakya is one of the largest monasteries in Tibet and the ancestral temple of Sakyapa sect of Tibetan Buddhism, it was from here that the whole of Tibet was once governed and it’s historic buildings were spared the destruction of the cultural revolution. The monastery is divided into two on either side of the zhongqu river. The hillside northern temple was built by khonchok gyelpo, the founder of sakyapa sect in 1073 but it has been largely deserted and very little remains of the original monastery structure. The more famous and impressive southern temple was constructed as a fortress-like complex in 1268 after Tibet was unified by the Yuan empire, and it has mongolian-style outer walls and murals by painters from Tibet, China, Nepal and India depicting wrathful and peaceful deities. After breakfast we visit the famous Tashilhunpo Monastery. One of the few monasteries that survived the Cultural Revolution, it is the traditional seat and burial site of the Panchen Lamas. Cobbled streets wind around the aged buildings and circumnavigating the monastery is a one hour kora that takes you up into the hills behind the compound. The main attraction here is the ‘Great White Wall’ upon which are hung massive colourful thangkas during festivals. On the way to Gyantse, we visit Shalu Monastery, a short distance from Shigatse. It is a small monastery founded in 1040 by Chetsun Sherab Jungnay and over the centuries has been known as a centre of learning and psychic training. Another well-known feature of the monastery is its mural paintings which, according to some Tibetan people, are the most ancient and beautiful in Tibet. The monastery was also the first of the major monasteries built by noble families of the Tsang Dynasty and it subsequently became an important centre of Buddhism in Tibet. During the afternoon we arrive in Gyantse which is famous for the magnificent tiered Gyantse Kumbum, the largest chorten in Tibet and home to over 100,000 Buddhist images. The Gyantse Dzong dominates the skyline and is well worth visiting as is the sprawling compound of the Pelor Chode Monastery near the Kumbum. It is also worth spending a little time exploring the back streets to experience the old world charm of the town. Today we depart for Lhasa. On the way we pass the summit of the Kamba-La Pass (4,974 m) and several hundred metres below lies the stunning Yamdrok-Tso, a beautiful turquoise lake set amongst breathtaking scenery and one of Tibet’s most sacred lakes. Far in the distance is the huge massif of Mt. Nojin Kangtsang (7,191m) After travelling through wide open meadowlands dotted with whitewashed villages, stunning views and crossing the Brahmaputra River, we arrive in Lhasa. 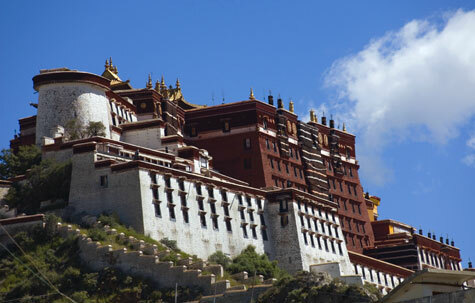 Today we have arranged for you to be taken on a guided tour of the fascinating city of Lhasa and you start the day with a visit to its cardinal landmark - Potala Palace. One of the great wonders of world architecture, it was the former winter home of the Dalai Lama and probably the image of Lhasa that most people have in their minds when they think of Tibet. Learn more about its eventful history as you explore the countless rooms of richly decorated rooms, halls and palaces as pilgrims bring silk scarves, coins and yak butter to the shrines as offerings. We then visit the Barkhor. Perhaps similar to the Kathmandu area around Durbar Square and Freak St, monks sit cross-legged on the streets with alms bowls and the low murmour of prayers can be heard in the air while nearby stall owners offer jewel encrusted daggers with enthusiasm. Away from the square you can begin the Barkhor circuit including Mani Lhakhang (huge prayer wheel), Nangtse Shar (former jail and dungeons) before arriving at Jokhang Temple the spiritual centre of Tibet. In contrast to the Potala, Jokhang Temple is buzzing with activity and pilgrims from every corner of Tibet arrive here to worship. The temple is the product of Han, Tibetan and Nepalese architectural styles and is, quite simply, the most revered religious structure in the whole of Tibet and a ‘must’ on any Lhasa/Tibet itinerary. The aroma of yak butter mixed with incense, and the murmur of prayer drift throughout the temple whilst at the entrance, there are always prostrations being made by pilgrims. Inside the temple you pass statues of the four guardian kings before reaching the exposed inner courtyard, or Dukhang, and the former throne of the Dalai Lama. The inner prayer hall houses six large statues including Guru Rinpoche, Avalokiteshvara (sometimes referred to as the Bodhisattva and should be well known to any students of Tibetan Buddhism) and Jampa (Future Buddha). There is also a collection of chapels that encircles the statues and pilgrims walk around this courtyard (always in a clock-wise direction) visiting the various chapels along the way. We continue our tour of Lhasa with a visit to the Norbulingka, the former summer palace of the Dalai Lama which served both administrative and religious functions in the past. Norbulingka is divided into three areas: the palaces, government buildings and opera grounds which are considered the best public parkland in Tibet. During the summer and autumn months, the opera grounds become hubs of entertainment with dancing, singing, music and festivities, and also host the annual Sho Dun or ‘Yoghurt Festival’. We then travel to the Drepung Monastery, about 8 km west of central Lhasa and once the largest monastery in Tibet with over 10,000 monks. Enjoy a pleasant walk uphill to the monastery, to experience the solemn ambience inside the halls and chapels. From the hillside there are wonderful views of Lhasa and the distant mountains. Drepung is one of Lhasa’s two great Gelugpa monasteries, the other is Sera. Around 5km north of central Lhasa, Sera may not be as grandiose as Drepung, but is more serene and surrounded by many small temples. Every day at 3pm (except on Sundays), the famous ‘Buddhism Scriptures Debating’ takes place in the courtyard as monks follow the teachings of the buddha to question everything they are told. They supplement their debating with a variety of gestures including clapping their hands, pushing their partners for answers and plucking their prayer beads. After an early breakfast, we transfer you to the airport where you depart Lhasa and fly back to Kathmandu. On arrival, we meet you and transfer to the ancient centre of Bhaktapur. Formerly a capital of the Kathmandu Valley, the pedestrianised centre of Bhaktapur is full of squares and temples with some stunning wooden architecture. You have a tour here, as well as time to explore the narrow winding streets which bustle with life. In the afternoon we leave Bhaktapur and make a short drive uphill to the village of Nagarkot, which sits on a ridge at the north-eastern edge of the Kathmandu Valley. Accepted as probably the best of the valley’s mountain views, from the village lodges and hotels you can see all the way from Kanchenjunga in the east, past the tiny (from here!) peak of Mt. Everest, to Dhaulgiri in the west. A couple of kilometres walk from the village there is a lookout tower which affords an even more spectacular full 360º panorama. Stunning clear views are all but guaranteed between mid-October and March, with more chance of cloud and haze before and after this period. You can check the weather and the hotel will wake you if the morning is clear so that you can see the sun rise over the distant Himalayas. After waking early to enjoy the sunrise views, you have breakfast before walking downhill from Nagarkot. You start by walking through pine forest before following a ridge which brings you down through tiny Chhetri villages with wonderful views to either side, to the beautiful Changu Narayan Temple. From this temple at the end of the ridge, you can either drive back to Kathmandu or carry on walking and descend to the valley floor and the Manohara River. The walk today can be made as long or short as you would like it. Before returning to the hotel, you have a tour of Pashupatinath, the most important Hindu temple in Nepal. Although non-Hindus are not allowed inside the temple itself, you can see into the temple complex from the holy riverbanks where there are bathing and cremation ghats. We also visit the huge Buddhist Boudhnath stupa. From here we drive you back to Kathmandu in the early evening. We use a wide range of accommodation on this tour. While in Kathmandu and Lhasa the hotels selected are at the 3-star level, while the accommodation en-route is more basic. Upgrades to the hotels in Kathmandu and Lhasa are available on private departures. If you have specific requests for hotels, please ask for a private or tailor-made tour.